The Moghul rulers, who defeated the Qutub Shahi-I dynasty and occupied Telangana ruled from 1687 to 1724 A.D. for 37 years. The Mosire Alamgir, written by Mohammed Saki mustabud helped a lot in reconstructing the history of moghuls in Telangana. This book gave details about the Bijapur and Golconda attacks and the vic¬tories of Aurangazeb who took the title of Alamghir. As the Moghuls conquered Bijapur and Golconda kingdoms, the whole of Deccan went under their controls. Aurangazeb divided it into six parts- Khandesh, Berar, Aurangabad, Bidar, Bijapur and Hyderabad. Aftpr the moghuls settled down here, he transferred all the local Golconda employees to northern India and had gotten rid of locals. He did not keep a large army either in Golconda previously. He brought north Indians here to work as govern¬ment employees and thus destroyed the character of Hyderabad. After Aurangazeb conquered the Golconda kingdom, he transformed it into Hyderabad subha and appointed Rahullah Khan as the subedar of Hyderabad in 1687 A. D.
During the reign of Rahullah Khan in Hyderabad, the Deccan Viceroy of Aurangabad was khan Aijahan Jafar Jung Kokaltash. During Rahullah Khans period law and order were not maintained in Hyderabad. He removed all the Hindu employees from his court. He did not respect even the local Muslims and reduced the powers of Hindu Zamindars. As the Golconda war was fought for a long time, agriculture was suspended in many parts and production of food grains decreased. Local industries and handicrafts were almost destroyed. Previously the largest trade centre of the Deccan (South India), Golconda was reduced to bamkrupta- cy by them. As the capital of Deccan was Aurangabad, all the revenue from taxes went there. Local Zamindars started to harass and exploit common people. In brief, the Golconda which was flourishing previously had become chaotic in just one year under the moghul rule. In this background the Maratha bandits groups attacked Hyderabad kingdom, plundered and pillaged it. As the army provided was very small, the subedar of Hyderabad, Rahullah Khan fleed to Golconda fort and lid there. Later, as he could not manage the kingdom properly, he left his post and went away to Delhi. Khan Sifir Khan replaced him as subedar of Hyderabad in 1688A.D. Khan Sifir Khan had worked as the Subedar of Bijapur for same time before he was appointed in Hyderabad. He earned a good reputation as a good army Chief and administrator. Kokatash continued as the Viceroy of Aurangabad during Sifir khan’s reign also. Sifir Khan suppressed the attacks of Marathas and took measures to bring law and order under control. For that purpose, he got some forts repaired, and assigned strong army forces there.Capable Fauzdars were appointed to protect the forts. The forts renovated were Koulas, Elgandala, Narsapur, Kohir, Bhuvanagiri, Warangal and Khammam Mettu. With these measures, the king¬dom got proper protection. He also appointed Deshmukhs to collect taxes and trained Fauzdars for military protection. Sifir Khan transformed the lands upto 15 kilo meters around the forts as Haveli agricultural fields; they were called as Haveli lands. The revenue from these lands was used for the maintenance of forts and armies. Fauzdars themselves collected the taxes from those lands. Aurangabad was made the capital of all six sub- has in Deccan. The viceroy of Deccan used to live there. Every Subah was controlled by a subedar and a Fauzdar. Golconda was transformed into an army settlement, and lost its historical character and province. A Subedar was appointed for the administration of Hyderabad. A Fauzdar was appointed for the pro-tection of Hyderabad city, a Kotwal for the protection of law and order and a Bakshi to manage the department of intelligence. Subahs were divided into circars. There were more circars in Hyderabad Subah than in any other one in Deccan. 5. Warangal 6. Koilakonda 7. Golconda 8. Bhuvanagiri 9. Ghanapur 10. Nalgonda 11. Devarakonda 12. Panagallu and 13. Khammam mettu. Hyderabad state was called as weghat and southern region was called as the Balghat. During the qutub Shahi rule, some people gained the powers of collecting taxes, (Izara). They were called as Izaradars. They had become strong later and even took titles like manne Sultan. Most of the Zamindars of that period belonged to the Kamma, Reddy and Velama communities. After the fall of Golconda kingdom these zamindars did not co¬operate with the moghuls, collected taxes from peo¬ple as they liked and harassed them in every way possible. Even the Moghul Fauzdars could not con¬trol them as they were worried about revolts from people. Ultimately subedar Sifir Khan had come to an understanding with them. According to it, each Zamindar would get a part of the tax collected in his paragana (area). If they themselves collect the taxes and paid the revenue to moghul officials, they would get their share and they could continue to be the pro¬tectors of law and order and could build forts and etc. As all these conditions were agreeable to the zamindars, they started working for the moghul rulers. In this way Sifir Khan administered the Hyderabad Subha properly and settled Moghul dominance and authority. He also brought law and order under control. His agreement with the Zamindars helped them to become prominent. The Koulas, Jataprolu, Gadwal, Paloncha and Nurkoil Zamis settled down and become rich during this period only. Aurangazeb appointed a Diwan called Mohammed Shah to help Sifir Khan in Revenue administration. Under the Moghul rule, a subedar and Diwan, with equal powers were appointed to every subah. The Diwan of Hyderabad, Mohammed Shah removed the Izara system in Hyderabad state. He decided the amount of tax to be collected from each district and prepared a list. It was named as the Zam-e – Kamir. Taxes were collected according to this list. Thus the revenue never wavered. This sys¬tem continued for 100 years in the Hyderabad state. Under the Moghul rule, Khiledars and Fauzdars committed a lot of atrocities on common people and exploited them; they destroyed several Hindu temples and built Idgahs and Dargahs. They levied higji taxes on people. Sarvai Papanna, a Telangana local leader, revolted against the atroci¬ties of moghul rulers and fought for the rights of peo¬ple. He captured Nalgonda, Orugallu and Karim nagar regions; built forts Tatikonda, Shahpuram, Sarvaipet and Vemulawada and ruled them for 20 years. The most prominent incident of Telangana history under the Moghul rule was the revolt of Sarvai Papanna. From the last part of 17th Century to early part of 18th Century, Sarvai Papanna revolted against the despotism of Muslim rulers and the exploitation of Velama lords or Zamindars. The birthplace of Papanna was Lingampally village near Tatikonda of Warangal district. Though he was born in the Gouda community, he did not continue in it for long. He revolted against the atrocities of the Muslim rulers from the beginning and had become the first revolu¬tionist of Telangana. Dudekula Piru, Hasan, Kummari Govindanna, Hussain, Inam, Chakali Sarvanna and Mangali Masanna helped him in this revolt. He invaded the Golconda fort with an army of the above and other common people, occupied it and ruled it for some hours. Later he built a fort at Sarvaipet and started a movement against the Moghuls. He also built another earthen fort at Shahpuram. The Fauzdar of Kolanupaka had come to know the revolt preparations of Papanna and sent an army led by Qasim Khan. Papanna killed Qasim Khan then Aurangazeb sent Rustum Dilkhan to fight with Papanna and he was also killed by Papanna. After the death of Aurangazeb in 1707A.D. Bahadur Shah ascended the Delhi throne. During that period, Papanna captured the Bhuvanagiri fort in Nalgonda district and Warangal fort in 1708. He took the many from those forts and built a very strong fort at a distance of 8 miles to Shahpur. Muslim subedar, Yusuf Khan decided to put an end to Papanna’s exploits sent an army under the lead¬ership of a person called Dilawar Khan. Dilawar Khan captured the Shahpur and Tatikonda forts, took Papanna as prisoner and brought him before Yusuf Khan in Hyderabad. There, Yusuf Khan killed Papanna, cut his head displayed it before Hyderabad fort and sent his body to Moghul Sultan Bahadur Shah. Thus ended the revolution of Sarvai Papanna in 1710A.D. After the death of Khan Sifir Khan in 1700, Aurangazeb appointed his younger son’ Kambaksh as the subedar of Hyderabad and Rustum kham, son of Sifir Khan as Nayab. As Rustum Khan had expected to get his father’s post (Subedar), he did not co-operate with Kambhaksh and tried to weaken and displace him. Between 1701-1702 A.D. 20 lakh people died due to plague and a severe drought. As Aurangazeb health started to suffer, he could not win battles with Marathas in the Deccan. On the other hand, Rustum Khan helped Marathas in their attacks on Hyderabad, which destroyed law and order situation in the state. Due to all these the financial position of Hyderabad Subah declined and administration became chaotic. After the death of Aurangazeb in 1707, hereditary battles arose, Azam Shah died in them and Mouzam ascended the throne of Delhi with title of Bahadur Shah, in 1708. Bahadur Shah removed Kambaksh from the post of subedar of Hyderabad and encouraged Rustum khan to revolt to keep his authority over the state. But Kambhaksh captured Rustum Khan and declared him of com¬mitting treason and executed him. Later Bahadur Shah himself invaded the Hyderabad state, imprisoned Kambhaksh and restored his authority there. After Kambhaksh, Dawood Khan Panni had • become Hyderabad Subedar and Yusuf Khan was appointed as the Fauzdar. Yusuf Khan was an Afghan Mansabdar. One prominent incident among his rule was that he stopped the revolutionist activities of Sarvai Papanna killed him and restored peace in Hyderabad Subah. Yusuf Khan died in 1711. Hyderabad state wit-nessed chaotic incidents again after his death. The attacks of Maharashtrians expanded; Moghul Fauzdars harassed local zamindars and exploited people. In this background, Delhi sultan Bahadur Shah died in 1712. In the hereditary war that ensued, Jahandar shah Pasha had become the Sultan. He was weak and was defeated by Farukh Siar, who was helped by Sayyad brothers. Faruku Siar ascended the Delhi throne. During the above conflict, a person called Khamruddin secretly sup¬ported the Sayyad brothers. In exchange for that, Sayyad brothers removed the Deccan Subedar Dawood Khan Panni and appointed Khamruddin as the royal representative of Deccan with the title of Nizam – ul – mulk. By the time of Nizam – ul – Mulk’s appointment, the administration of Hyderabad was in pieces. Local Zamindars stopped paying taxes and tributes. The attacks of Marathas increased. In this back¬ground, the Moghul emperor Farukh Siar appointed Mubariz Khan as the Fauzdar of Hyderabad. Khan was a capable administrator. He brought the situa¬tion in Hyderabad under control and restored law and order which increased Nizam – ul – Mulk’s strength. As the Sayyad brothers did not like the power of Nizam – ul – mulk to increase, they removed him as the subedar and Hussain Ali, one of the Sayyad brothers, replaced him in 1715 as the Deccan Subedar. Though Hussain Ali was appointed as the sube¬dar of Deccan Mubariz Khan continued as the Fauzdar of Hyderabad Subah. Meanwhile Farukh Siar prepared a plot to kill Sayyad brothers. Hussain Ali went to Delhi to Convince the Sultan to remove Farukh Siar from his post, and his son Alam Ali Khan took up the administrative responsibilities of his father as the subedar of Deccan. Meanwhile, the Marathas made agreement to collect taxes called Chaut and Sardeshmtikh in the six subahs of Deccan. Which created dual rule administration in the Deccan. Sayyad brothers who had become kingmakers, removed Farukh Siar and replaced him first, with Rafi Ud daraj, then Rafi – Ud daula and later with Mohammad Shah. In this heriditory battle, Nizam – ul – Mulk did not help the Sayyad brothers and so was removed from his post as the Governor of Malwa. Nizam – ul – Mulk wanted revenge and decided to reclaim his authority and post in the Deccan. In this, he was helped by Mubariz Khan, Hyderabad Fauzdar and Rajasbai, Kolhapur ruler. Nizam captured the forts of Assirgadh and Burhanpur with their help. Sayyad brothers sent Dilawar Khan to stop the activities of nizam. They bought a battle at Khadwa, in which Dilawar khism was killed by the Nizam. Later, the son of Hussain Ali, Alam Ali khan attacked Burhanpur and was also killed by Nizam. After these victories Nizam went to Aurangabad and declared himself as the Subedar of Deccan. He wag supported by the Fauzdars of Hyderabad, Bijapur and Kurnool. The friendship between Mohammad Shah and the Sayyad brothers did not last long. Mohammed killed the Sayyad brothers with his cunning, and appointed Nizam – ul – Mulk, subedar of Deccan as his Vazir in 1722 A.D. But the services of Nizam as a Vazir did not satisfy either Mohammed Shah or the Delhi rulers. So Nizam again went to Deccan. To punish the Nizam, who did not him, Mohammed appointed Mubariz Khan (Fauzdar of Hyderabad), as the Subedar of Deccan. Mubariz Khan prepared to kill Nizam with the help of his Fauzdars. The two. parties met at Shakar Khera in 1724 A.D. and in violent battle that ensued, Mubariz Khan died and Nizam became the victor. Though Qasim Razwi khan, Fauzdar of Bhuvanagiri and others later tried to revolt against the Nizam from Golconda, they failed. In this way, Nizam – ul – mulk, who fought against the Moghul dominance had become an inde¬pendent ruler in 1724 A.D. and founded the Asaf Jahi dynasty in the Deccan. 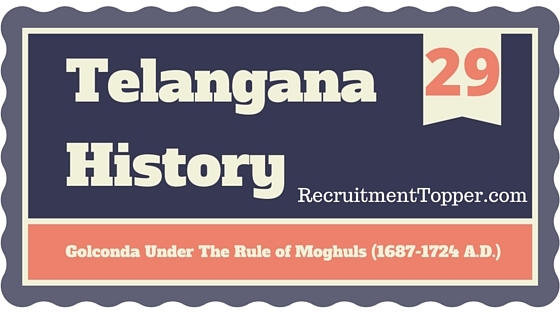 Thus The Moghul rule ended in Hyderabad in 1724. ★ In which year Moghul power in Hyderabad came to an end –1724 A.D.
★ In which year independent Hyderabad kingdom came into existence 1724 A.D.
1. How many years Telangana was ruled by Moghuls ? 2. Aurangazeb divided deccan into how many parts ? 3. In which year Hyderabad was made of Subha? 7. Who was the Viceroy of Deccan during the period of Aurangazeb ? 8. Who appointed as viceroy of Deccan during the period Bahadur Shah ? 9. The title of Ijaradars who with collect the faces ? 10. The Diwan appointed by Aurangazeb to help in the revenue administration to Sisirkhan ? 12. When did Sarvai Papanna occupied Bhuvanagiri fort ? 1. 1704 A.D. 2. 1705 A.D.
13. In which year kambaksh, son of Auranghzeb appointed as Hyderabad Subedar? 14. Who occupied the throne at Moghuls after the death the Aurangazeb ? 15. Who served as Hyderabad Subedar between 1708-1713 ? 16. Who appointed as Hyderabad Faujdar dur¬ing the regime at Dawood Khan panni ? 17. In which year Moghul emperor Bahadur Shah was dead ? 18. Who had the title Nizam-ul-mulk? 19. In which year Nizam-ul-mulk, appointed as Hyderabad Subedar ? 1. 1712 A.D. 2. 1713A.D. 3. 1714 A.D. 4. 1715A.D. 20. When did Hussain Ali became Hyderabad Subedar in place of Nizam-ul-mulk ? 21. When did Mohammed Shah appointed Nizam, who is a Deccan Subedar as his Vazir? 3. 1722 A.D. 4. 1723 A.D.
22. In which year the rule of Moghuls came to an end in Hyderabad ? 3. 1723 A.D. 4. 1724A.D.